View of part of St John's College, Cambridge overlooking the river from the south west. The range of buildings date from 1671 and are part of the Third Court. Each building is ended with a Dutch style decorative gable. The stone bridge was built between April 1696 and 1712 to replace a previous wooden bridge. A college audit book for 1711-12 records payment to the stone mason Robert Grumbold, and two other workmen for 'cutting two Eagles placed upon the piers' and also for 'iron work about the new gates at the end of the Back Lane'. 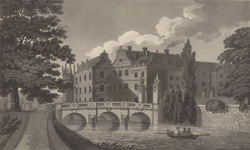 The bridge led to St Johns College Meadow on the other side of the river and also to a tennis court.